Mimosas... champagne brunch... visions of sipping a refreshing cocktail on the deck of a seaside restaurant all came to mind when I saw Leeks Vinaigrette with Mimosa as the recipe this week for French Fridays with Dorie. My vision began to sober as I read the ingredients... no champagne... no cocktails... it is called Mimosa because when you grate egg over the leeks it looks like the FLOWER Mimosa. Being a person who never grows anything I can't eat... I never knew there was a flower called Mimosa. I really only thought it was the name of cocktail. Egg in my face; well, not exactly.. more like over my tenderly boiled leeks, it took about 10 minutes to get my young leeks fork tender. Drizzled with a Dijon vinaigrette and blanketed with a grated hard boiled egg... lunch was delicious... but I still would have liked to have had an excuse to make cocktails. Wow the leeks look amazing! I host Tasty Tuesdays and would love it if you linked up this recipe. I’m sure our party goers would love it as much as I do. Here is the link http://bit.ly/1g5mVQa. Have a wonderful day!! I'll be linking it up next week. I already posted 3 recipes at your party. The simplicity of this is absolutely gorgeous! Yup. The mimosa thing threw me for a loop too. So I take it you were disappointed too. LOL..I had the same thought process!!! Your photos are spectacular!!! Thank you Liz... it is all because of you that I started on the right path to better photography. I have to admit that I was expecting eggs not oranges and champagne (though a glass would have gone with this!). I did really enjoy it. Your dish looks beautiful. You must have been familiar with the cooking term mimosa... but I was disappointed in the lack of drink, but not in the recipe. I was a bit baffled by the mimosa thing too! However, I did enjoy this dish….you were so lucky to find thin young leeks! They look wonderful! Happy Mother’s Day, Diane! Have a great day! When I see that most people couldn't find the young leeks I feel very lucky. Happy Mother's Day to you too. Cocktails go with everything right? I am glad the dish turned out well for you. Cocktails can even make a bad meal not so bad. But I genuinely enjoyed these leeks. So what we have learned here is that we Doristas, if offered, never pass a cocktail or two. I also thought this recipe involved champagne and orange juice. I was all fired up for it, I must admit. I overcame my disappointment after making this and discovering how delicious it was. You are one of the few who could find young leeks. This is a vegetable that I will use more often. Did your kids like it or was this just a lunch for you? It was just a lunch for me, but my kids like leeks. I put them in soup often. They think of them as large scallions. THe cocktail is named after the flower as well...the color. Usually "mimosa" in this regard refers to just the yolk grated over the top. Dorie is so madcap though. Oh I also hoped there was going to be champagne involved somewhere in the recipe! I skipped this one because I do love leeks but not when they are whole and just poached so I didn't want to ruin a very good streak with the last few of Dorie's recipes. I tried the vinaigrette on its own last night and loved it! 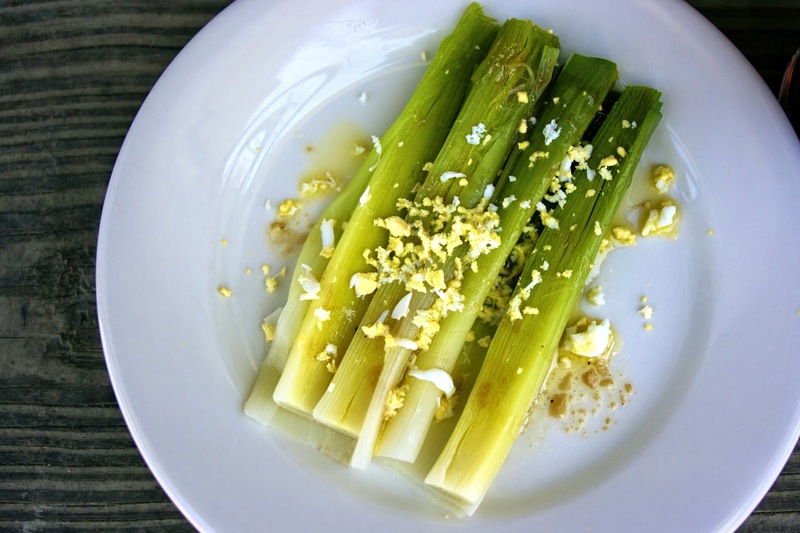 You might be surprised at how good the leeks taste with the vinaigrette and the egg. Not what I expected. I was also concerned about eating straight up leeks. I hope you're planning to enjoy a champagne mimosa (rather than egg) with your Mother's Day breakfast tomorrow. Yes, I enjoyed this too, though preferred it plain, not so much with the egg/mimosa garnish. I don't get the mimosa thing either! What we call mimosas here (the flower/tree) are pink and fluffy/fuzzy. I'm guessing there's a yellow version of this plant. Now you have me wondering how leeks would be adding the flavors of a mimosa cocktail. I only discovered leeks a few years ago, but I've come to like them very much. Thank you for linking, Diane. Hope you had a happy Mother's Day! I'm new to leeks also and I love them... like a mild onion. I think an orange dressing on leeks would be really tasty... maybe some champagne vinegar. I actually had to google mimosa flower to find out what the heck it was. The only mimosa I had ever heard of before was the alcoholic kind. I googled it too. Never saw them before. Wot??!! I tot I commented earlier? Going to make myself a mimosa (to drink) soon! 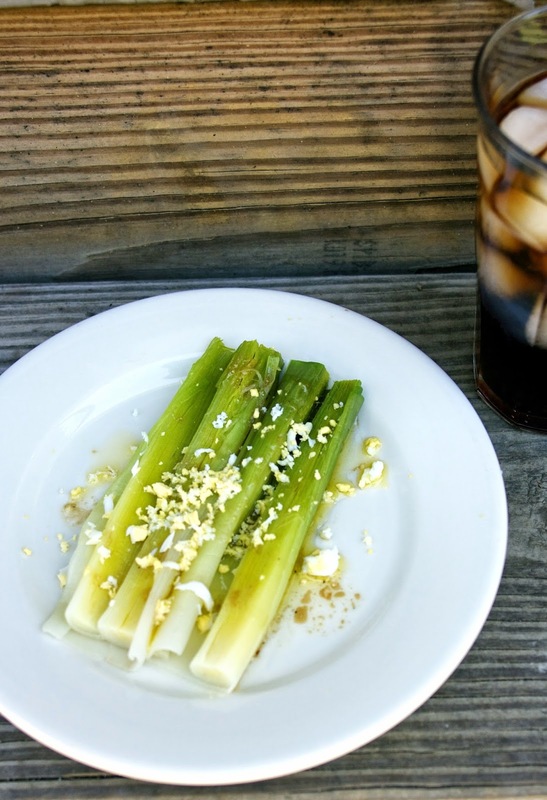 I'm going to try leeks this way for sure, they look amazing. They will be perfect with your fresh eggs. I would have thought Mimosa was a drink too! Thanks for sharing with us at MM this week - pinned! Funny how words mean different things depending on their context. I learned something new today. I didn't know you could do anything with a mimosa but drink it! The drink takes it's name from the flower mimosa too. that sounds fabulous! I plan on trying leeks this month too. 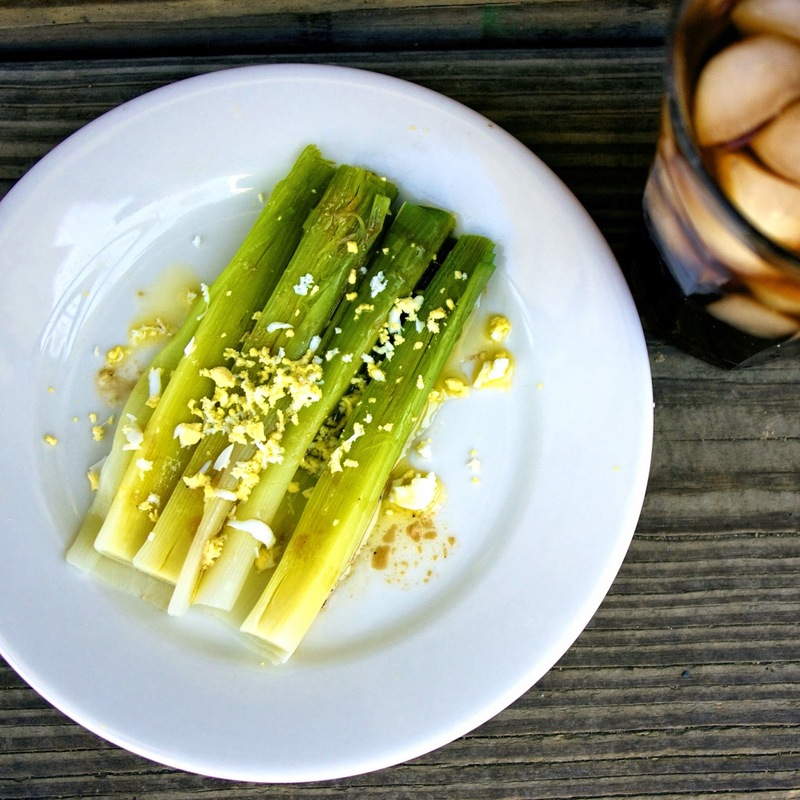 This is a great recipe for the Leeks and the Vinaigrette is wonderful! Thanks so much for sharing this awesome recipe with Full Plate Thursday. Hope you are having a great weekend and come back to see us real soon! It is light, healthy, low cal, and a nice change from cold salads. I really think orange would be a great flavor with this dish, an orange vinaigrette.